It’s been a few weeks since I broke the bobcat, and I’ve been fighting all this time to get it back up and running again so I can get back into the building groove. My first problem was getting the machine apart, to figure out what was wrong. I have a service manual for it (which was an effort in itself to find, but the Internets came to the rescue) but typically, the illustrations are of a brand spanking machine (not one which has done twenty years hard labour, with the associated … “repairs”) and the instructions assume the machine is in a dry, level workshop, not stranded at a precarious angle on the side of a muddy, sodden hill. For example in order to gain access to the chain case covers, first you must remove the floor panels, pedals, seat, steering yoke and the assemblies to which it attaches. Easy, according to the manual - simply raise the lift arm and engage the locking pins (which are suspiciously absent on my machine) and you stand in front of the machine under the lift arm with all the bits within easy reach. My problem, though, is that the machine is stuck on the hill with the backhoe attached to the lift arm, and the stabiliser feet are really the only thing keeping it from succumbing to the forces of gravity. So even if I could remove the backhoe (which I can’t because the bobcat needs to move in order to do that) I need it to stop rolling down the hill, since the brakes have never worked even a little bit. 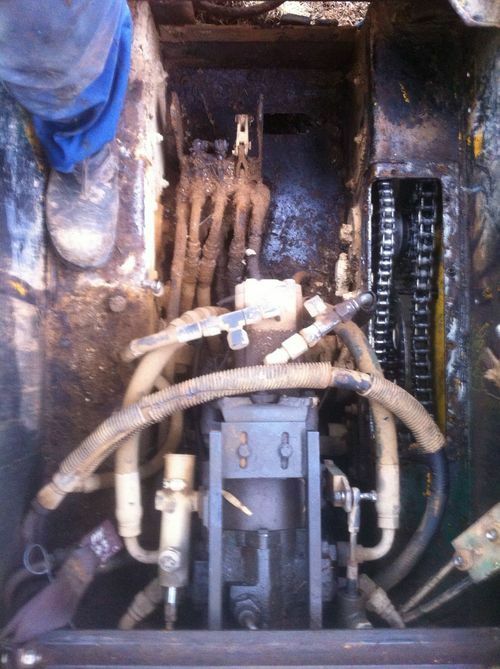 Oh, and then… this machine is filthy!! 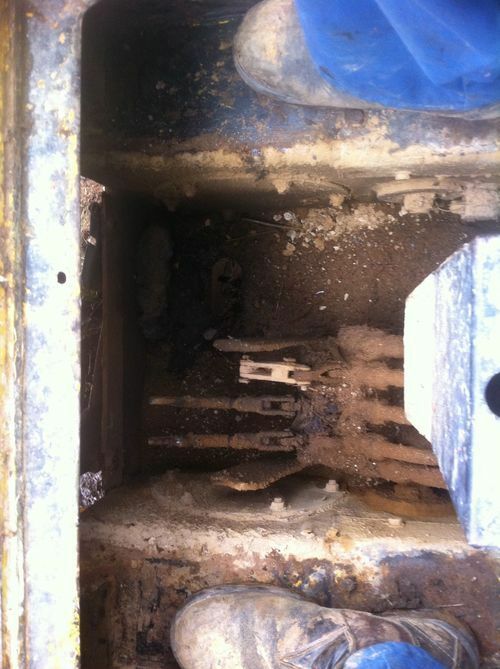 The guts are chock full of oily, gritty yuk and every surface is caked in the stuff. Getting it out is an exercise in patient contortionism, scraping and suction, in that order. And it has to come out too, because I can’t open the chain case until it’s all gone lest I contaminate the mechanicals. Anyway, a little later on and I could finally see what I was dealing with. 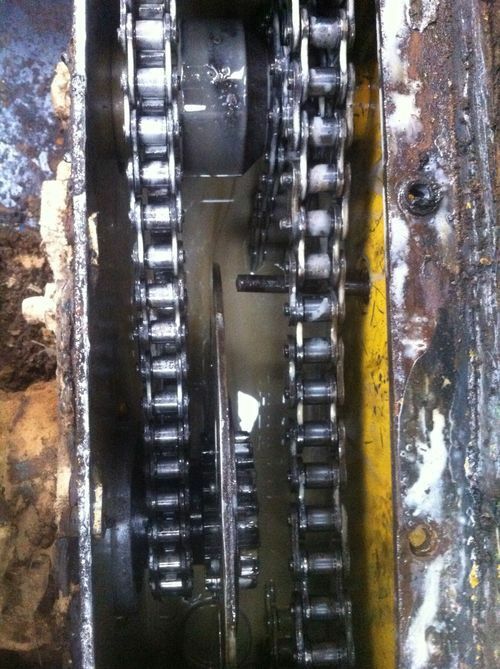 The chains (both primary drive and secondary) appear to be intact, and remarkably in pretty good condition. The oil bath I expected to find in here looks a lot more like a mayonnaise bath. 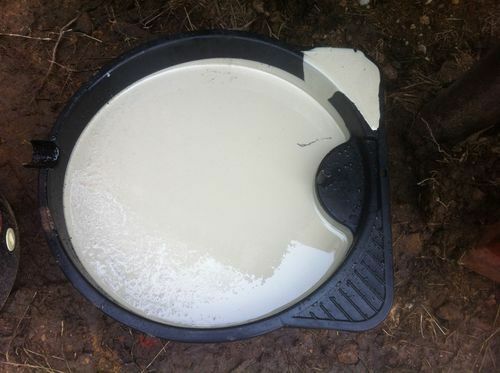 Who says oil and water don’t mix? It took a bit of fishing around upside-down in the chain case, but after I could see the bottom of it, voila! One idler sprocket! I also eventually found the two bearing cages and half of a one-inch-diameter, grade 8 high-tensile bolt. 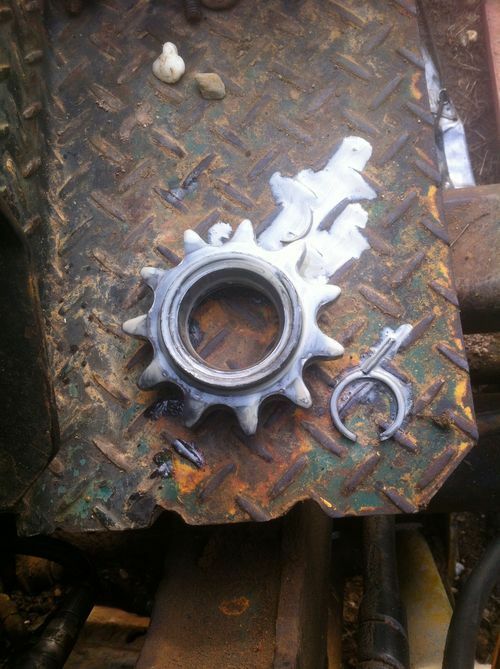 What appears to have happened is that the continual tension from the chain on the idler sprocket has caused a fatigue failure of the bolt, upon which the bearing and sprocket run. It’s a daft design - there is no support for the inner end of the bolt-axle, so it has been free to flex over the years until it finally gave up with a bang. So now I have the job of finding a replacement idler assembly. Thankfully, every part in the book has a unique part number and so I actually stand half a chance of finding a supplier and ordering the correct replacement.